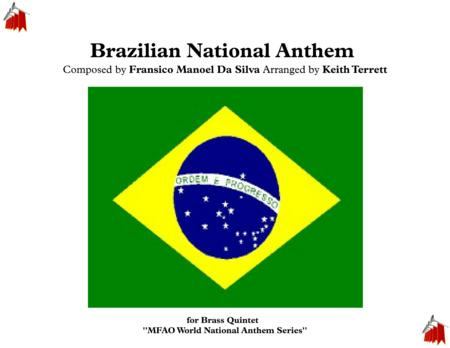 The national anthem of Brazil arranged for Brass Quintet.The "Brazilian National Anthem" (Portuguese: Hino Nacional Brasileiro) was composed by Francisco Manuel da Silva in 1831 and had been given at least two sets of unofficial lyrics before a 1922 decree by President Epitácio Pessoa gave the anthem its definitive, official lyrics, by Joaquim Osório Duque-Estrada, after several changes were made to his proposal, written in 1909.The anthem's lyrics have been described as Parnassian in style and Romantic in content.The melody of the Brazilian national anthem was composed by Francisco Manuel da Silva and was presented to the public for the first time in April 1831. On 7 April 1831, the first Brazilian Emperor, Pedro I, abdicated the Crown and days later left for Europe, leaving behind the then-five-year-old Emperor Pedro II.From the proclamation of the independence of Brazil in 1822 until the 1831 abdication, an anthem that had been composed by Pedro I himself, celebrating the country's independence (and that now continues to be an official patriotic song, the Independence Anthem), was used as the national anthem. In the immediate aftermath of the abdication of Pedro I, the anthem composed by him fell in popularity.Francisco Manuel da Silva then seized this opportunity to present his composition, and the anthem written by him was played in public for the first time on April 13, 1831. On that same day, the ship carrying the former Emperor left the port of Rio de Janeiro. The date of April 13 now appears in official calendars as the Day of the Brazilian National Anthem.As to the actual date of composition of the music presented in April 1831, there is controversy among historians. Some hold that Francisco Manuel da Silva composed the music in the last four months of 1822 to commemorate Brazil's independence (declared on 7 September 1822), others hold that the hymn was written in early 1823 and others consider the evidence of composition dating back to 1822 or 1823 unreliable, and hold that the Anthem presented on 13 April 1831 was written in 1831, and not before. In any event, the Anthem remained in obscurity until it was played in public on 13 April 1831. In style, the music resembles early Romantic Italian music such as that of Gioachino Rossini.Initially, the music composed by Francisco Manuel da Silva was given lyrics by Appeals Judge Ovídio Saraiva de Carvalho e Silva not as a national anthem, but as a hymn commemorating the abdication of Pedro I and the accession of Pedro II to the Throne. It was known during this early period as "April 7 Hymn". The lyrics by Ovídio Saraiva soon fell out of use, given that they were considered poor, and even offensive towards the Portuguese. The music, however, continued enjoying sustained popularity, and by 1837 it was played, without lyrics, in all public ceremonies.Although no statute was passed during the imperial period to declare Francisco Manuel da Silva's musical composition as the national anthem, no formal enactment was considered necessary for the adoption of a national anthem. A national anthem was seen as resulting from praxis or tradition. Thus, by 1837, when it was played in all official solemnities, Francisco Manuel da Silva's composition was already the Brazilian National Anthem.A new set of lyrics was proposed in 1841, to commemorate the coming of age and Coronation of Emperor Pedro II; those lyrics, popular but also considered poor, were soon abandoned too, this time by order of Emperor Pedro II, who specified that in public ceremonies the anthem should be played with no lyrics. Emperor Pedro II directed that Francisco Manuel da Silva's composition, as the national anthem of the Empire of Brazil, should be played, without lyrics, on all occasions when the monarch presented himself in public, and in solemnities of military or civilian nature; the composition was also played abroad in diplomatic events relating to Brazil or when the Brazilian Emperor was present.During the Empire of Brazil era, the American composer and pianist Louis Moreau Gottschalk, then residing in Rio de Janeiro, Brazil, composed two nationalistic works of classical music based on the Brazilian National Anthem that achieved great popularity during the imperial period: the Brazilian Solemn March ("Marcha Solene Brasileira", in the modern Portuguese spelling or "Marcha Solemne Brazileira", in the original spelling in force at the time of composition and the Great Triumphal Fantasy on the Brazilian National Anthem ("Grande Fantasia Triunfal sobre o Hino Nacional Brasileiro"). The former was dedicated to Emperor Pedro II, and the latter was dedicated to his heiress presumptive, the Princess Imperial Isabel, comtesse d'Eu. Those works are in the vein of similar compositions written at the time in other Nations, such as Charles Gounod's Fantasy on the Russian National Anthem. The Grand Triumphal Fantasy, long forgotten, resurfaced in popularity in 1985, at the dawn of Brazil's New Republic, during the country's re-democratization process, when it was played to accompany the funeral cortège of President Tancredo Neves.After the Proclamation of the Republic in 1889, the new rulers made a competition in order to choose a new anthem, and the competition was won by Leopoldo Miguez. After protests against the adoption of the proposed new anthem, however, the Head of the Provisional Government, Deodoro da Fonseca, formalized Francisco Manuel da Silva's composition as the national anthem, while Miguez's composition was deemed the Anthem of the Proclamation of the Republic. Dedoro himself was said to prefer the old anthem to the new composition that became the anthem of the Proclamation of the Republic. The Decree of the Provisional Government (Decree 171 of 1890) confirming Francisco Manuel da Silva's music, that had served as the National Anthem of the Empire of Brazil, as the National Anthem of the new Republic, was issued on 20 January 1890.In the early days of the new Federal Republic, the National Anthem continued without official lyrics, but several lyrics were proposed, and some were even adopted by different states of Brazil. The lack of uniform, official lyrics would only be terminated in 1922, during the celebrations of the first centennial of the Proclamation of Independence, when an adapted version of Joaquim Osório Duque Estrada's lyrics, first proposed in 1909, were deemed official.The official lyrics of the Brazilian National Anthem were proclaimed by decree of President Epitácio Pessoa (Decree 15.761 of 1922), issued on 6 September 1922, at the height of the celebrations of the Independence Centennial. This presidential decree was issued in execution of a legislative decree adopted by Congress on 21 August 1922.The national anthem is considered by the current Constitution of Brazil, adopted in 1988, to be one of the four national symbols of the country, along with the Flag, the Coat of Arms and the National Seal. The legal norms currently in force concerning the national anthem are contained in a statute passed in 1971 (Law 5.700 of 1 September 1971), regulating the national symbols. This law regulates in great detail the form of the national anthem and how and when it is to be played.The music of the national anthem was originally intended to be played by symphonic orchestras; for the playing of the anthem by bands, the march composed by Antão Fernandes is included in the instrumentation. This adaptation, long in use, was made official by the 1971 statute regulating national symbols. This same statute also confirmed as official the traditional vocal adaptation of the lyrics of the national anthem, in F major, composed by Alberto Nepomuceno.Due to the fact that the traditional vocal adaptation composed by Alberto Nepomuceno for Joaquim Osorio Duque Estrada's lyrics of the national anthem was made official in 1971, other vocal arrangements (as well as other instrumental arrangements departing from the one recognized in law) are unofficial. Because of that, for the remainder of the Military Regime era (that lasted until 1985), the playing of the anthem with any artistic arrangement that departed from the official orchestration and vocal adaptation was prohibited, and there was strict vigilance regarding the use of the National Symbols and the enforcement of this norm. Since the redemocratization of the country, far greater artistic liberty has been allowed regarding renderings of the national anthem. Singer Fafá de Belém's interpretation of the national anthem (initially criticized during the final days of the Military Regime, but now widely accepted), is an example of that. In any event, although the use of different artistic arrangements for the anthem is now permitted (and although the statutory norms that prohibited such arrangements are no longer enforced, on the grounds of constitutional freedom of expression), a rendering of the national anthem is only considered fully official when the statutory norms regarding the vocal adaptation and orchestration are followed. However, the traditional vocal adaptation composed by Alberto Nepomuceno was so well established by the time it became official that the interpretations of the national anthem that depart from the official orchestration or from the official vocal adaptation are few. Indeed, although other arrangements are now allowed, the traditional form tends to prevail, so that, with few exceptions, even celebrity singers tend to only lend their voices to the singing of the official vocal adaptation by Alberto Nepomuceno.The anthem is sung in Brazil's official national language, the Portuguese language.For more of my original music, great arrangements and all the national anthems of the world, check out my on-line stores:http://www.scoreexchange.com/profiles/keith_terrethttp://musicforalloccasions.org.ukhttp://www.sheetmusicplus.com/search?Ntt=keith+terrett.